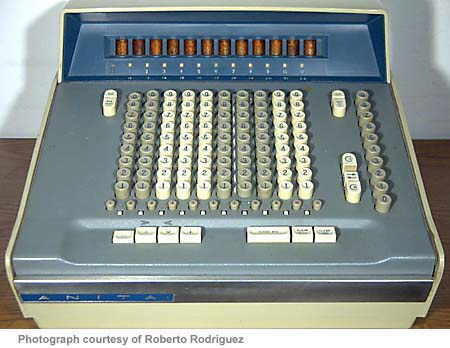 The ANITA Mk 9 is similar to the ANITA Mk 8, but with additionally the capability of chain multiplication, e.g. "a" times "b" times "c" times "d" and so on. Again it has the full keyboard used in the Mk VII and Mk 8 and uses cold-cathode tube technology. 12-digit, "Nixie" type tube display. 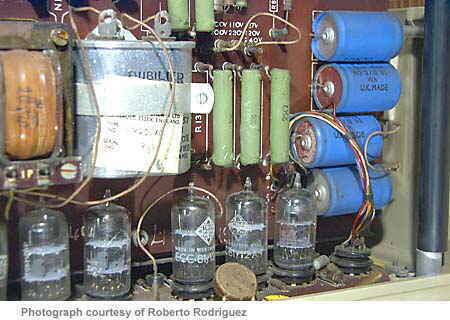 The electronics is also similar to that of the ANITA Mk 8, and uses a Dekatron decade counter tube, cold-cathode switching tubes, selenium rectifiers, and vacuum tubes (thermionic valves). Price in 1968: £375 (about US$890). The machine pictured here is a Mk9. The Mk9A has the column of buttons that are on the far right moved one place to the left, with the bank of three buttons moved past to the right. There is an operating manual for this machine in the Operating Manuals & Leaflets section. Close up of the keys and display. The keyboard, on the right has been hinged completely over to reveal the electronics inside the machine. On the left are the red-coloured numerical display tubes, each mounted on the edge of a counter board. 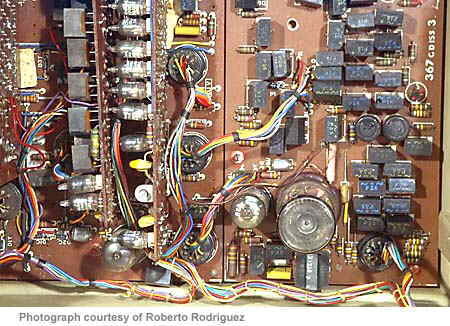 The Dekatron counter tube is in the lower middle of the photograph. 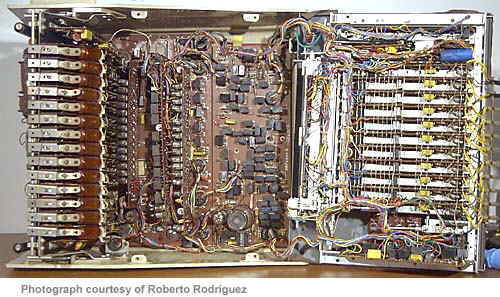 Inside the rear of the machine with the power supply and more vacuum tubes. These are mounted right at the back of the main board, underneath vents when the casing is replaced, to provide an outlet for the heat generated. "Desk top calculator", The Manager, December 1964, p61. 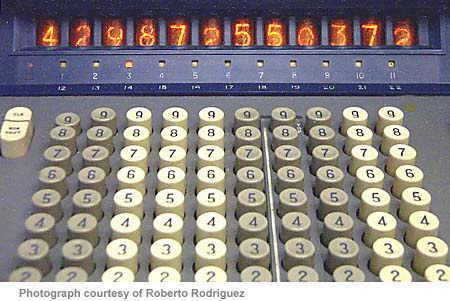 If you have information about the development of Anita calculators, or know of somebody who worked there, please get in touch with me .